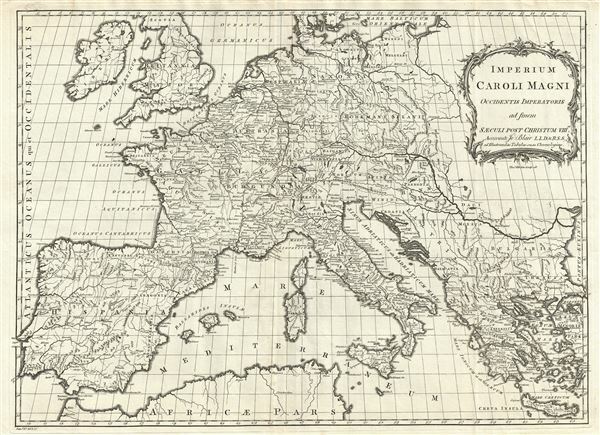 This is a beautiful example of a 1768 Thomas Kitchin map of the Empire of Charlemagne. It covers Europe and the European empire of Charles the Great from Scotland south as far as Africa and from Portugal to the Black Sea in the east. The map is highly detailed, noting several towns, rivers, islands and other topographical details. A decorative title cartouche appears in the top right quadrant. After ruling and reforming France in 768, Charlemagne conquered Italy and, in 800, was crowned Holy Roman Emperor. For the next 14 years until his death, Charlemagne's empire untied much of Western and Central Europe for the first time since the collapse of the Roman Empire. The 'Carolingian Renaissance' witnessed a catholic themed revival of art, religion and culture, encouraging the formation of a common European identity. This map was issued by Thomas Kitchin in 1768.